Recipe from Jennifer Williams, Consumables Marketing Manager, Wal-Mart. 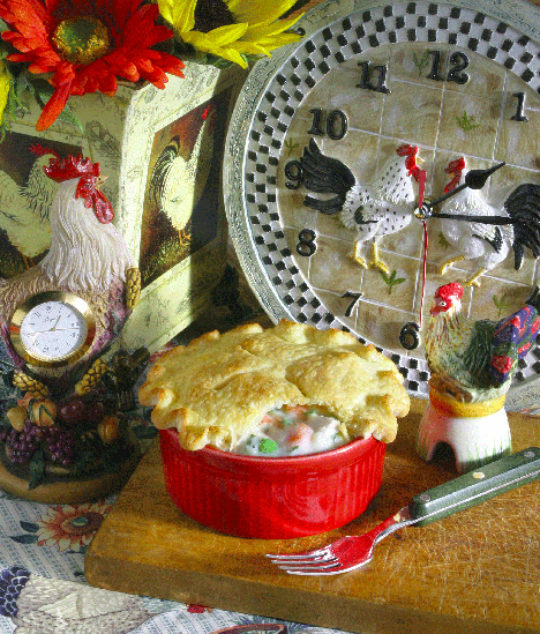 No need for the dinner bell... your chicks, and even your rooster, will scurry to the kitchen when the aroma of this chicken pot pie fills the room at dinner time. 2 cups diced assorted vegetables — choose from zucchini, yellow squash, green bell pepper, red bell pepper, carrots, celery, peas ... any of your favorites! Bring 1 cup broth to a boil in a large pot. Add onion and cook 3 minutes, or until soft, then add remaining 1 cup broth, potatoes and thyme. Add zucchini, yellow squash, red and green peppers, mushrooms, salt and pepper for the last minute. Meanwhile, combine cornstarch and milk and stir until smooth, add mustard. Stir in chicken and remove from heat. Pour into one 9-inch, deep-dish pie plate, or divide into 6 individual smaller dishes. Roll crust into circle large enough to cover 9-inch pie plate or individual ramekins. Cover filling and pinch edges to side of pan. Cut vents into top and bake 20 minutes, or until top is golden.